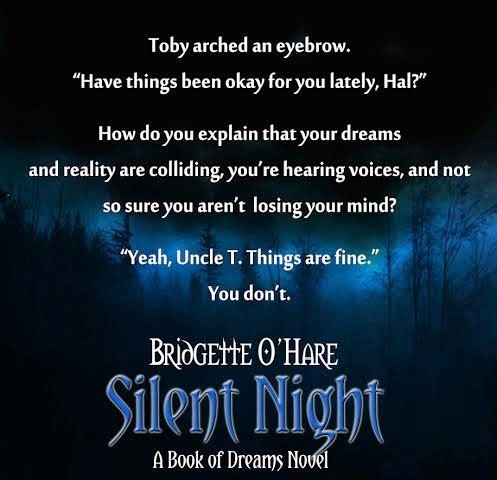 So, today is the day to promote and review Bridgette O'Hare's 'Book of Dreams' series! This is a Young Adult's urban fantasy series that you can purchase on Amazon! 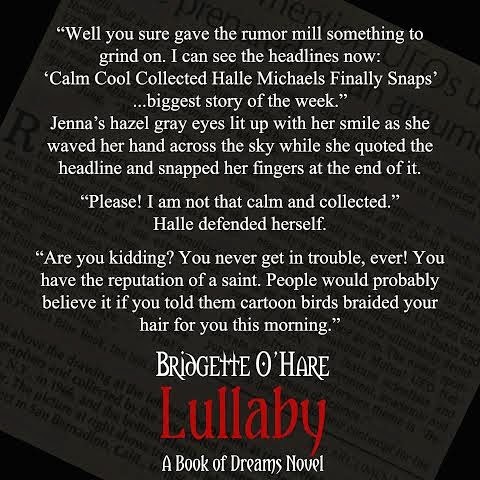 First up: Check out 'Lullaby' the first in the series and Halle Michaels' beginning! Here's an excerpt to peak your interest in the beginning of this series! Matt laughed and picked up his glass to finish off his tea, but his laughter stopped as quickly as it started. His glare focused abruptly on the café entrance. Halle turned to glance over her shoulder at a group of guys she recognized from school, mostly football players. One stood out. That explained it. Even now, almost two years later, Halle nor Jenna knew what had gone down between the two. Matt and Brandt had been through a few run-ins since sophomore year. The consensus was it had started over a girl, but there was never any solid proof and Matt would never talk about it. The most Halle had ever gotten out of him was a grunt or a brush off of the subject. She stopped trying about halfway through junior year. “Boys.” Jenna scoffed in Halle’s direction, knowing Matt wasn’t paying attention to anything she said at the moment. Halle just rolled her eyes slightly and shook her head. There would be no use in even trying to talk to Matt for a good fifteen minutes. Matt motioned to get the waitress’ attention and requested the check. Matt was already standing by his chair when the waitress brought the check. He handed her several bills, told her to keep the change, then headed for the stairs. Halle and Jenna never said a word. They knew this mood. It was not a talking mood. Thinking ahead, Jenna was clever enough to make sure she was a buffer between Matt and Brandt as they headed for the exit. Aedan and Sapphira followed. “I’ll meet you back at the safe house. I have a stop to make.” Sapphira didn’t allow Aedan time to ask questions. She traced out of the café. Matt and Jenna were through the front door when Halle stopped dead still, a few feet short of the door. Ice trailed down her spine and a faint, sinister voice spilled through the air. “She’s the one.” Her gaze drifted back around the café, slowly and methodically. Surely she wasn’t the only one who heard that? Aedan didn’t recognize the voice he heard, but he did recognize the distinctive bile that emanated from it. His quick, desperate check of the surroundings tried to pinpoint the origin. No luck. It was a familiar feeling he wished wasn’t so familiar. Second: Review time! So here is what I thought of ‘Silent night’! 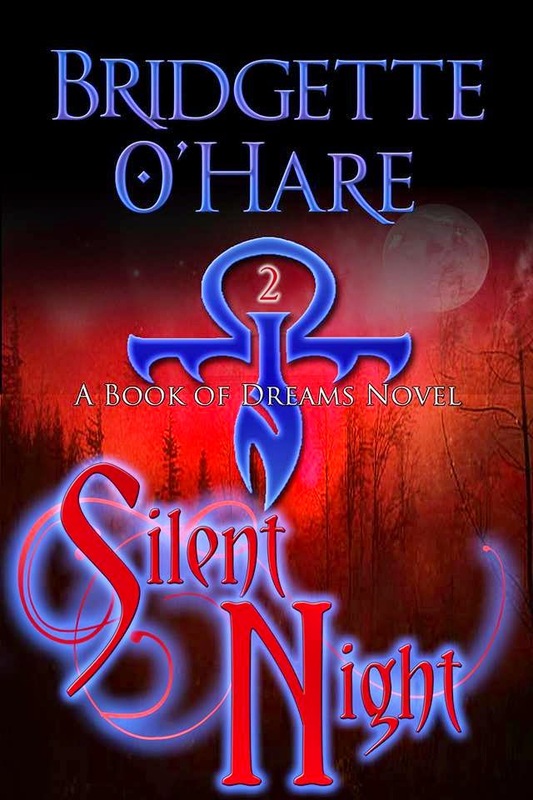 ‘Silent Night’ is the second book in O’Hare’s series. It begins at a point almost directly after the first book and is about developing and unearthing more about Halle Michaels, her strange ability to hear voices and have strange dreams and the secrets she has been left to search out from a book her Uncle Toby sent her from Egypt. The second book is strongly written, more so than the first. The pace is fast and the plot is dense, with a good focus on the real mysteries and obstacles the characters faced. In saying this, I did not enjoy the way this book ended and I personally would have preferred the final chapter to be cut as I feel it is a little disjointed from the rest of the novel’s flow. However, as I have yet to read the third book in the series (coming soon, watch Amazon and O’Hare’s page for its release! ); the next installment may enable this chapter to flow more in terms of the series’ narrative. 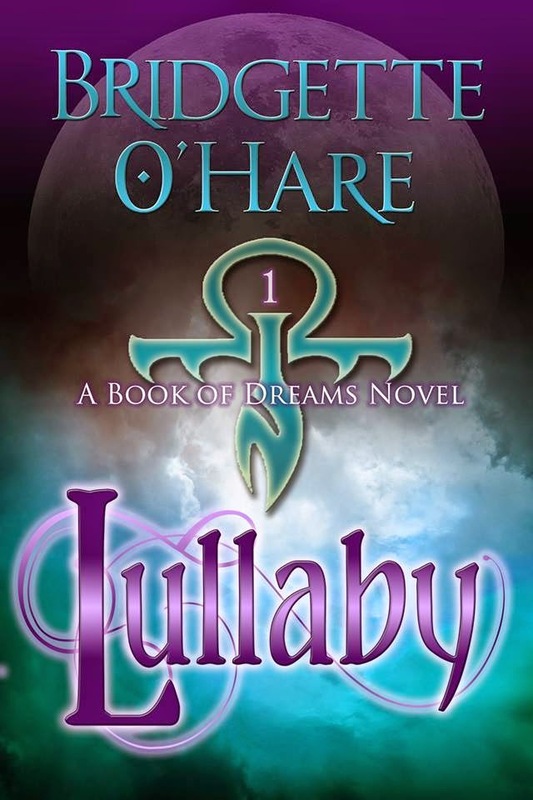 I enjoyed the character development and fullness of the characters involved within O’Hare’s novel. I really believe this is a strong point of her authorship. Halle in particular is very grounded and solid. I feel Halle is able to adapt well to her surroundings and situations and it is still realistic enough that will allow young adult readers to relate to her. I also think that the relationship between Halle and her two closest friends Jenna and Matt is worth a mention as this too works well and is relatable to the readers this series is aimed towards. I will make a note on the book’s editing. While I can overlook editing errors as long as there are not too many, I found it very distracting when O’Hare spelled one character’s name differently consistently throughout this book. The changeover between Nakita/Nikita (I have a feeling the author meant it to be the latter), can be frustrating and take you out of the story at times. I would also make a note of the Christian elements within this novel series. While this book is not marketed as Christian fiction or has such an overt tone to be marketed as such, the characters are religious themselves and references are made to biblical themes. So this is just a heads up in case this theme may not be what you are looking for yourself. Overall, I think this book is still well targeted to its audience and full in terms of plot and conflict for the characters. I believe those who read ‘Lullaby’ will definitely enjoy the sequel more to find out what happens to characters that feel very much alive.